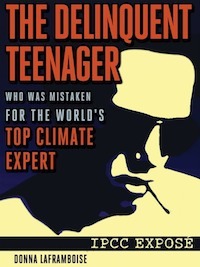 Donna Laframboise’s new book “The Delinquent Teenager who was Mistaken for the World’s Top Climate Expert” blows the lid clean off the biased and politicised organisation otherwise known as the Intergovernmental Panel on Climate Change. We have always known that the IPCC was a political construct. Senior figures at the World Meteorological Office and the United Nations had already formed the view back in the mid-1980s (based on virtually no evidence at all) that man-made carbon dioxide was damaging the climate, and all that was required was to find some science to back it up. Enter the IPCC. Established to find the evidence that was at the time so sorely lacking, the IPCC is manacled to the UN Framework Convention on Climate Change – a political agreement between nations signed in 1992 – which has been described by Rajendra Pachauri as the IPCC’s “main customer”. Even from that short introduction, it is utterly baffling how anyone (including our deluded government) could possibly still believe that the IPCC is an impartial scientific body. And yet the majority of the world’s climate policies are based on this organisation’s pronouncements. However, the story is far more complex and shocking than that. The Delinquent Teenager describes numerous examples of the scientific message being massaged and manipulated to fit the preordained outcome. Grey literature is welcomed when it fits the agenda (despite Rajendra Pachauri’s protestations that the IPCC is nothing but peer-reviewed literature) – but oddly that peer-reviewed literature is excluded or played down when it doesn’t. Lead authors in IPCC reports write articles in journals which are then cited in the report – even when those journals were published after the official cut-off date. But who cares if it helps bolster the case? The lack of scientific integrity would shame a senior school physics student. A classic example from the book is the much-touted link between natural disasters and “global warming”. The 2001 IPCC report claimed such a link, but the conclusion was based on a report prepared by an insurance company (Munich Re, an organisation which is well known for peddling climate alarmism, see here for example) which, naturally, would benefit financially from the greater demand for insurance that such a link may generate. The fact that this presents a clear conflict of interest seems to have escaped everyone down at IPCC Towers (funny how conflicts of interest with sceptics and oil companies seem to be pounced on rather more eagerly – as Daily Bayonet puts it, even accepting a free mug from a gas station is enough!). If that wasn’t enough, one of the Munich Re report’s authors was also a lead author on the IPCC report. But the story doesn’t end there. So a dubious finding that originated in a document written by an insurance company was included in the Climate Bible in 2001. It then made its way into the peer-reviewed scientific literature in 2005. By 2009 it was being treated as gospel by a US government report. Welcome to the confidence-inspiring world of climate science. There is much, much more. Every MP and Senator in Australia (and every attendee at the Durban Climate Summit) should be forced to read this book from cover to cover. Then maybe they would think twice about accepting without any critical thought the partisan conclusions of the IPCC. This is a must-read book, and it’s a bargain at only $4.99 on Kindle. It expertly and thoroughly exposes the IPCC for the compromised and corrupt organisation we always suspected it to be. Donna’s excellent blog, No Frakking Consensus, is here. just the title is worth a read. Excellent summary Simon … but let’s wait for the inevitable pal-review team pounce on how Laframboise is just a climate denier so anything she says should be dismissed outright, even if it is fact. They’ll be manning the parapets now … perhaps Donna has a big oil mug hidden in her cupboard! It’s just a matter of time, in … 3 … 2 … 1 …. (and every attendee at the Durban Climate Summit) should be forced to read this book from cover to cover. Why should they they would not believe a word of what is written anyway. When you have your fingers in your ears and your eyes closed you are not going to change your mind. Donna Laframboise has done an excellent job exposing how the IPCC is rotten to the core . But the world has been warned about the IPCC for years. Sadly, nothing has been done about it. The IPCC continues with its fraud… governments continue to believe in the work of the IPCC… the great global warming swindle just gets worse and worse… rotten scientists continue to receive praise… genuinely good scientists continue to be ignored, shunned, dismissed, etc. Nothing has changed. Nothing is going to change. This scandal will only be stopped the day the IPCC is dragged into a Court of Law and held accountable for misrepresenting the real science, and for engaging in misleading and deceptive conduct… trying to con the public with its “fools gold in climate science” reports. The question is how can the IPCC be dragged into Court? -Roger Kitching – Griffith University Australia – heads the Arthropod Diversity Lab at Griffith University studying climate change impacts on insects. -Dr Francis Chiew is a Science Leader in CSIRO Land and Water in Canberra and studies the sensitivity of mean annual runoff to climate change. – Professor Leslie Hughes studies the impacts of climate change on species and ecosystems at Macquarie Universtity. – Dr Sandra Schuster is a research analyst, assessing the risk associated with climate change related natural hazards in Australasia at MunichRE, based in Sydney. – Dr Penny Whetton is working to increase understanding of the potential impacts of climate change at the local and regional level in Australia with the CSIRO. – David Karoly is a self-appointed expert in climate change and lead author for the IPCC, with the University of Melbourne. … and this is only 1 small section that contain Australian authors, but guess what? They all predict catastrophic consequences due to anthropogenic global warming. Well of course they would … that’s what they’re getting paid to do! Australia, what happened to you people anyway? Just wait until a small portion of your carbon tax revenues begins to be funneled to the UN. Over time, the portion will not be small anymore. What will the UN do with that tax revenue? Begin to govern you of course. How did Australia end up sooo far left?